As a mid-priced rock-ready electric, we reckon you'll be impressed. Affordable. Easy to nail gained-up Satriani tones. Sounds great clean, too. We found it difficult to keep our review model in tune. Ibanez has always managed to ensnare more than its fair share of off-the-wall players in its artist roster - and instrumental giant Joe Satriani has stuck with the company since being snapped up in the 80s, after breaking through in a flurry of demisemiquavers, landmark albums and questionable hair. 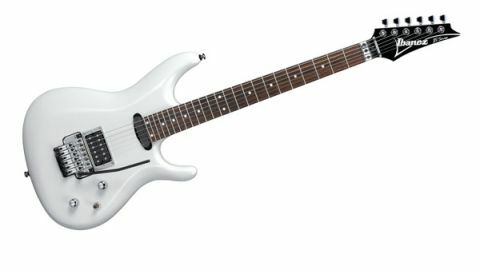 Joe's first signature model, the JS1, was introduced in 1989, and fast-forwarding to the here and now, this brand-new JS140 makes a welcome addition to 2015's Satriani signature range. "Satch wields a huge gain-soaked tone, and we found little problem in recreating it for our own use"
It's similar in vibe to the recently discontinued JS2400 (£1,749, if you can still find one), and is the first affordable Satch signature to sport 24 frets. Other features include a basswood body, which although in keeping with older JS models, does include the new slightly extended lower cutaway. The neck profile of the Japanese JS guitars is unmistakable in its narrow yet hefty feel, and while the one-piece maple neck of the Indonesian 140 comes close, it's not an exact match. We've played Joe's own JS2400, so we know of what we speak. Don't get us wrong, though: it's a good player, and those 24 frets really don't take too much time to get used to. Satch wields a huge gain-soaked tone, and we found little problem in recreating it for our own use. Pickups comprise Ibanez rather than the more pricey DiMarzio humbuckers of his higher-end guitars, but the output from the bridge unit is immense. The basswood body rounds off some of the high-gain edge to leave a wide and articulate rock rhythm tone that remains distinct as the gain increases. Add into the mix the more subtle neck pickup - which, with a bluesy tone, has a tone similar to a Strat on steroids - and you're left with a guitar that's tonally more versatile than you may have expected. It's a genuine pleasure to play cleanly, and using the coil-tap and toggle to combine the central pair of coils provides a tone that's fragile yet beautifully crystalline. We have but one niggle: we found our review model something of a struggle to keep in tune, even after stretching out the strings and adjusting the Edge-Zero II locking vibrato, which is frustrating. Is the JS140 as good as models such as the JS24P Premium? Well, no, but at £609 as opposed to £1,019, it's a good deal more affordable. We'd suggest that fans of the great New York shredster will be more than happy to deal with any compromises in spec and feel, and just get on with playing the damn thing. And those tuning issues? We're sufficiently accustomed to the Ibanez build quality to trust that those problems will iron themselves out as the guitar settles down. Whether the JS140 has what it takes to turn the heads of non-Joe acolytes remains to be seen, but as a mid-priced rock-ready electric, we reckon you'll be impressed.